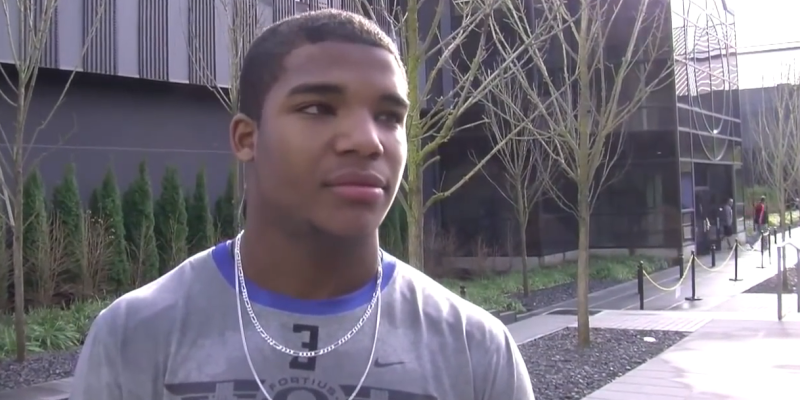 There is a lot for coaches and fans to focus on during spring practices, such as who will step up in the secondary, what true freshman will make an impact, and most importantly, and who will be the starting quarterback in 2015? 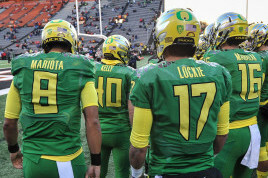 Mariota (8), Lockie (17), and Mahalak (16) last season in the Civil War. The Ducks might have too much of a good thing at the quarterback position. Oregon has leadership experience in junior Jeff Lockie, playmakers in redshirt freshman Morgan Mahalak and sophmores Ty Griffin and Taylor Alie, all of which are getting many reps this spring. Moreover, the list doesn’t include Vernon Adams Jr. who is expected to be a starter following his graduation from Eastern Washington in June. Hence, with so many talented individuals at quarterback, who will stand out from the group? Griffin (far left) wasn’t able to dress down last season. Griffin’s main focus is to improve at QB, but he’s willing to use his versatility to help the team in any way possible. “It’s really not that difficult. I know the routes; just trying to keep a positive attitude, help out the team,” Griffin said about taking reps at receiver. Last year, he was forced to sit out after transferring from Georgia Tech, but with three years of eligibility left, he has ample time to impress the coaches. Back in 2008, Oregon used quarterback Chris Harper as a receiver, and in that season he became the first Duck to run, catch, and throw for a touchdown since 2000 (Joey Harrington in the Holiday Bowl victory over Texas). Harper’s best game as receiver came against Arizona State, where he caught five passes for 85 yards and a touchdown. With the depth Oregon has at receiver, it’s unlikely that Griffin will be asked to put up those type of numbers, but using him as a playmaker to catch the defense off guard is certainly not out of the question. The depth chart for quarterback is uncertain at the moment, but Griffin could be as low as third or fourth when the season begins. And with the receiving core being as talented and deep as it is, he is unlikely to have much in-game action. However, minimal action can still be deadly if he capitalizes on his opportunities. 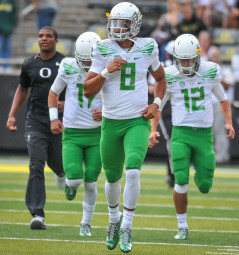 The 2015 season will be a new chapter in Oregon football, as it’s the first season in the post Marcus Mariota era. Fans will be focusing on all the new changes across the board, but particularly on the quarterback position. Keep your eyes peeled for QB Griffin, because he may be playing a different position when the season starts. Chris HarperJeff LockieMorgan MahalakOregon DucksOregon Ducks FootballTaylor AlieTY GRIFFINVernon Adams Jr.